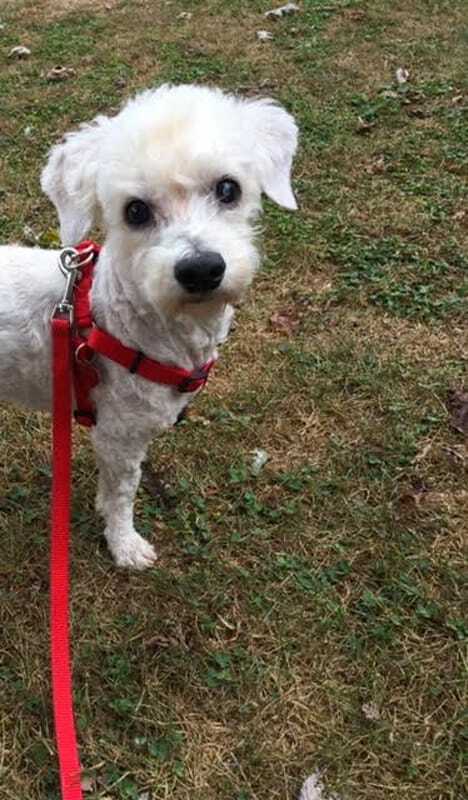 Indy ended up in a Georgia shelter with a thick, grey, matted coat, and not much hope until the Blind Dog Rescue Alliance stepped up to rescue him. He came to his BDRA foster home in Virginia in late September 2016, and is now ready for a forever home! 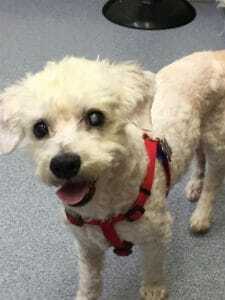 Indy is a Bichon (maybe a mix? ), and is estimated to be about 7 years old. He weighs 14 pounds. And he is in good health overall! He just had a dental, and he still has all his teeth! He is learning about getting his teeth brushed in his foster home. His heart and lungs are good. He has cataracts in his eyes, but still has some vision. He hears well. He had two hemangiomas (benign lumps) removed, and is recovering well. He does have arthritis in his hips, but is on a pain medication (vetprofen) and gets around fine, although should not be expected to go up and down full flights of steps. Indy gets along very well with the other dogs in his foster home, and ignores the cat. He is housebroken, leash trained, and crate trained. He sleeps quietly through the night. He is friendly with people, and has won the hearts of the staff at the vet clinic. Sometimes he gets a little nervous in a new situation (although has not growled, snapped, or bitten). He is, in general, a relaxed, very well-behaved little dog. He is such a sweet boy, and should have many years ahead of him. He is now waiting for the right person to fill out an adoption application! Will it be you? To learn more about Indy see his blog here. Indy is looking for his forever home. If you think it could be yours, read more about Adopting from BDRA before submitting your application below. BDRA relies on your donations to rescue blind dogs around the United States. Please consider giving in support of Indy.